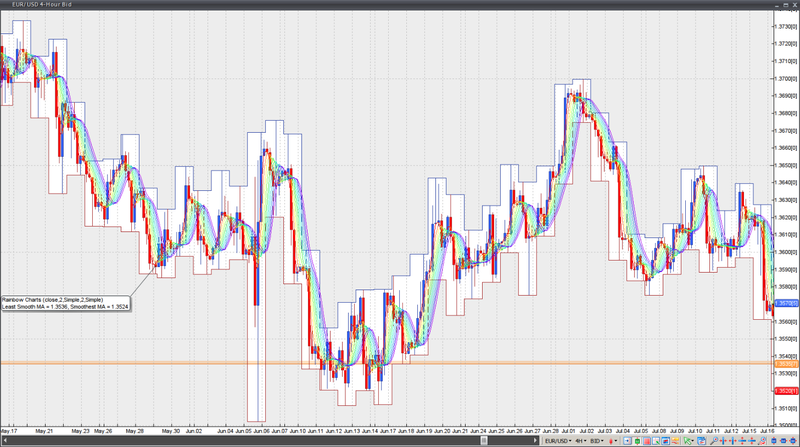 If you have any questions or suggestions you are welcome to join our forum discussion about Rainbow Charts. Developed by Mel Widner and originally described in the July 1997 issue of Technical Analysis of Stocks and Commodities magazine, the Rainbow Charts indicator is a trend-following one. The core of the Rainbow Charts is a 2-period Simple Moving Average, to which recursive smoothing is applied. This way nine other moving averages are created, with each new one being based on the previous moving average. Recursive smoothing creates a full spectrum of trends and if different colours are used, when visualized on a price chart, they appear in the form of a rainbow. Interpretation of this indicator is quite simple. In case the market is in a bull trend, the moving average with the least smoothing (the red line) stays on the top of the Rainbow and the most smoothed moving average (the purple line) stays at the bottom of the Rainbow. In case the market is in a bear trend, the most smoothed moving average stays on the top of the Rainbow and the moving average with the least smoothing stays at the bottom of the Rainbow. While the market is moving to the upside or to the downside, the moving averages track it and cross in a sequential order, as the move goes on. In case the price distances from the Rainbow, this indicates a potential continuation of the underlying trend. This will usually cause the Rainbow width to increase. In case the price approaches or goes into the Rainbow, this indicates a potential trend reversal. This will usually cause the Rainbow width to decrease. The way the price penetrates into the Rainbow signals how strong the move is.